Set your business apart with natural board Business Cards. We can print and dispatch yours today! If you want to print more than 1 kind of artwork with the all the same options (size/ stock/ colour/ artwork/ quantity), then rather than processing each item separately you can nominate how many kinds/ sets of artwork you have. For example, if you have 4 sets of postcards and want 50 of each, you would enter the Quantity: 50 and Kinds: 4. If you just have 1 item to print, select 1 from the Kinds dropdown menu. Freight is calculated once you have added all items to your cart and proceed to checkout, but below is a guide as to what you can choose from. You are more than welcome to pop-in and pick-up your order personally. There is no charge for pick-up. Delivery is approx. 4 hours from dispatch*. Available for items dispatched by 1 pm. From $15 depending on weight and location. If you need it sooner, try an UBER. If time is particularly short, we can organise an UBER delivery. Pricing is dependant on dispatch time and date, so this will be invoiced separately to your order and requires payment prior to dispatch and someone to meet the driver at the street. Once you have added an item to your cart, a cart icon will appear at the top right of your screen. You can click the cart icon to review your items check out, or you can continue browsing and adding other items. When you need premium quality business cards urgently, Same Day Printing can get you organised today. 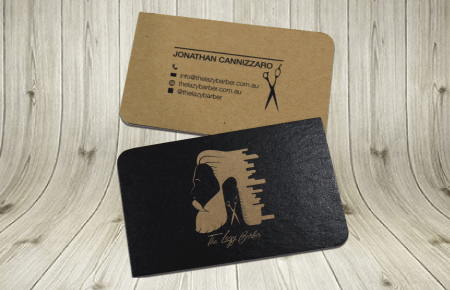 With one of the fastest business card turnarounds in Australia, and guaranteed on-time dispatch, we’ll help you take advantage of even last minute marketing opportunities. Whether you are looking for laminated business cards, custom cut business cards, or a different paper stock like recycled, or uncoated, simply review the options and place your order on the form above. Would you like to explore additional finishes to help your business cards stand out? We have a large range of finishes available for our fast business card printing services - you can access all of these including colour foil business cards, scodix business cards, spot uv business cards and more at our main business card menu page. What are business cards used for?